This is my very first “Reblog” but there is a reason I’m doing it for this post (keep reading!) :D. As you all know, I’m a HUGE supporter of artists and appreciate that art is expressed in a variety of mediums; from paintings, to making whisky, to writing, to performing, to creating recipes, cooking and beyond. 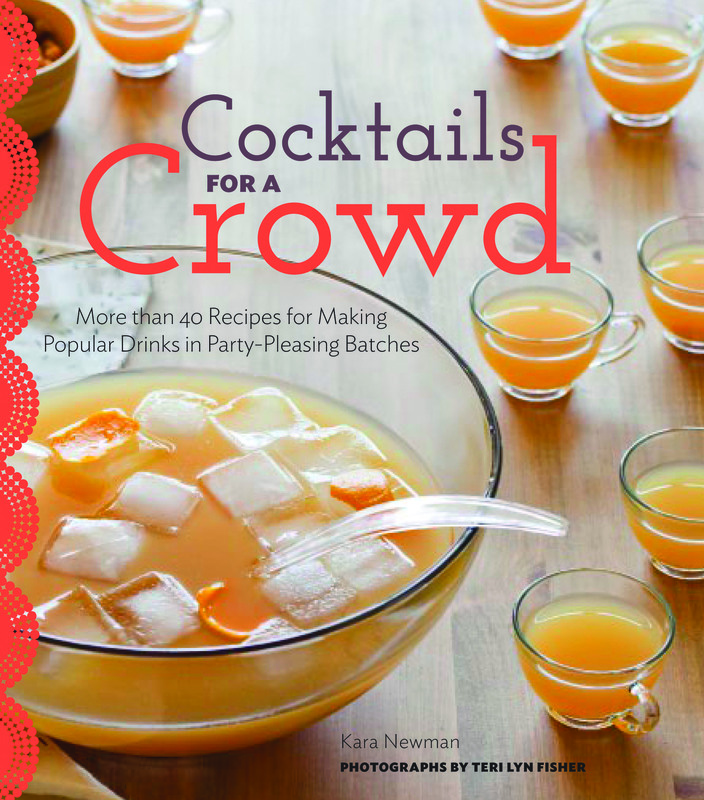 I wanted to write a shout-out post to an artist I respect, author Kara Newman, for her just-released book, “Cocktails For A Crowd.” But seeing as she’s a true writer AND wrote a blog post announcing the book and her summer book signing tour, I figured a reblog was more than appropriate this time. Oui? I hope the formatting is ok (again, total reblog virgin here!) but please enjoy, support & share your comments as always below! I’m off to buy a new punch bowl! Summer must be book-signing season! Here’s where to find me over the next couple of months. If I’ll be in your neck of the woods, please come out and say hello! Friday, August 23, 6:30-8pm – Cocktails for a Crowd: Summer Entertaining class at Astor Center, New York, NY. Hands-on class with cocktails galore; books will be available for purchase. There isn’t one particular reason that I love Suntory – but more a collection of experiences gained over the years. The first, and perhaps most important, being that they are the producers of “the dram” that set me down this path of total Whisky geekdom, which I will always attribute as being Suntory’s Yamazaki 18. The second being that we always have a bottle of the Yamazaki 12yr on hand – always (which I have reviewed in the past HERE). I have long admired the Japanese esthetic – and when it’s applied to luxury, it doesn’t typically come across as being ostentatious or glitzy glam – but instead clean elegance. And it was this minimalistic elegance that was on magnificent display a month ago on Tuesday, May 14th, at the Art of Suntory event at the Noguchi Museum in New York. This was no ordinary tasting, mind you, but an experience to not be quickly forgotten. 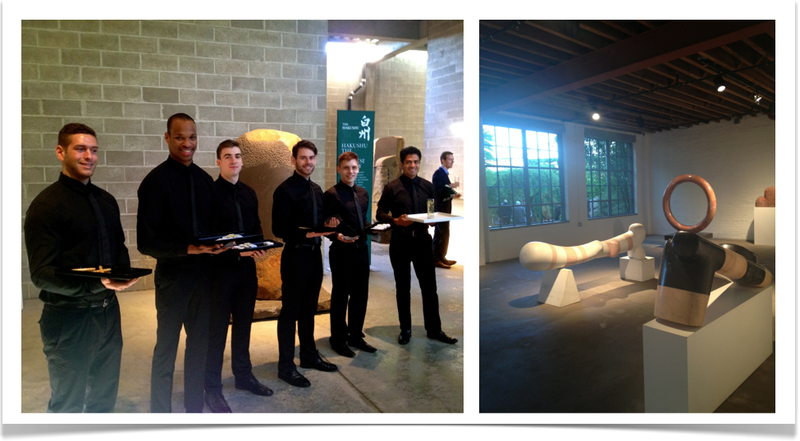 No attention to detail was spared – from the sleek slate gray invitation with the carefully commissioned muted gray cheery blossom photo stamp – a detail so quiet it was not done to stand out on its own but rather aid in setting the tone for the pending event – to the exquisitely chosen location; the striking Noguchi Museum. Entering the museum, we were greeted by a row of adoring fans … er … no, that’s not right …. rather a group of cheerful servers with delicate delicious amuse-bouches prepared by the renowned chef, David Bouley paired with a Hakushu 12 Highball. Delightful! And don’t think for a second that you were able to just “show up” … no, when I say they took care of everything – they did. We were given a choice to 2 convenient meeting points in Manhattan – where we then boarded luxury shuttle buses to be driven off to (and from!) the event in Queens. Talk about an entrance. We were first welcomed by being handed a printed Suntory silk scarf – the color of which signified your level as a guest (red was press!) which was folded origami style into a pouch containing the program for the evening, a press packet & whisky menu. Classy. After walking past the line of servers above, we strolled outside to connect with #WhiskyFabric friends new & old. You could feel the excitement building in the air. 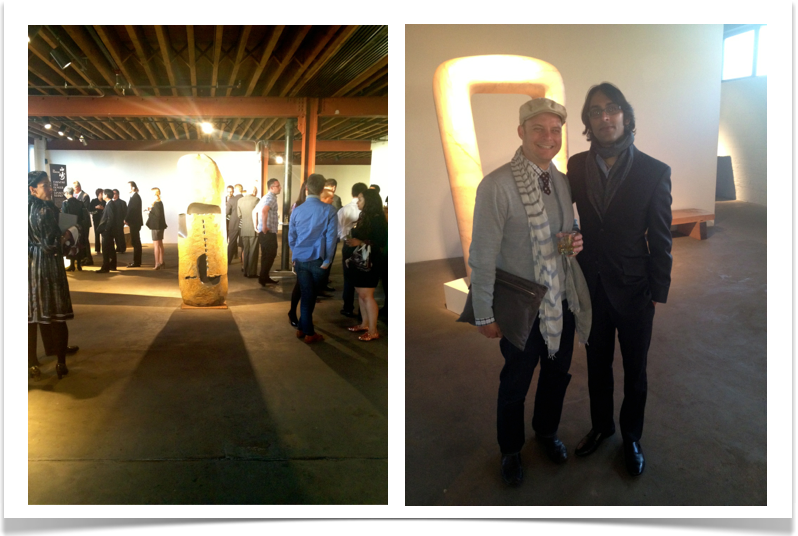 No one knew quite what to expect but the foundation for a stellar evening was laid. It kicked off outside with an impressive showing of whiskies and Suntory personalities, including CEO Toshi “TJ” Kumakora, Master Distiller Mike Miyamoto, USA East Coast Brand Ambassador Gardner Dunn and USA West Coast Brand Ambassador Neyah White, all of whom played an important role of guiding us through the evening. Neyah White kicked us off with a Japanese word (sounded like “omo”) that means: opening up barriers. This can take on so many forms – from our zen garden settings in the midst of urban NYC to the overall fact that the world whisky category is here to stay. 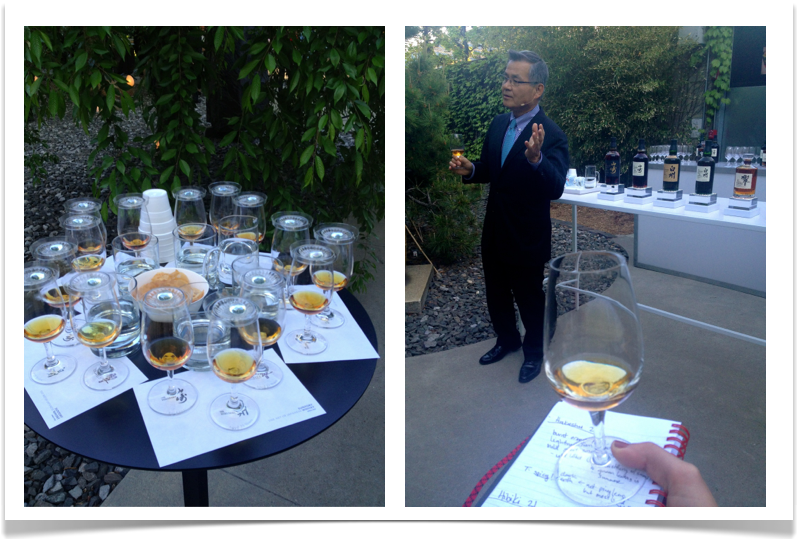 We heard from Mike Miyamoto (pictured below) who took us through the tasting and chef David Bouley who shared his own experiences of whisky + food coming together to enhance each other. YAMAZAKI 18YO | Nose: caramel, vanilla rooibos tea, sweet herbal notes | Taste: Herbal sweet & warming spice tea notes continue, long smooth finish. Heaven in a bottle. HAKUSHU 25YO | Nose: burnt orange peel, mild sweet smokiness, fresh flowers … lilies, bit of evergreen forest | Taste: Spicy! Dark earthy tones – not piny but more of moss/mold in a good way! HIBIKI 21YO | Nose: pear, honey, smoke | Taste: very balanced, not too many individual tastes popped out at me. Plenty of complexity. 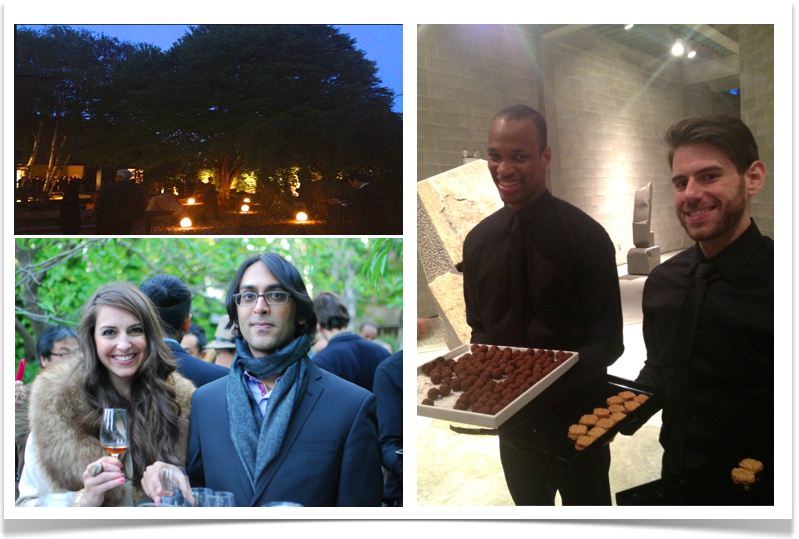 The weather was perfect for such an event which flowed seamlessly between the indoors & outdoors areas. In hindsight, I don’t remember ever consciously walking to a place because it was indoors or out – but rather because the mood (or, let’s face it, WHISKY!) was calling me! 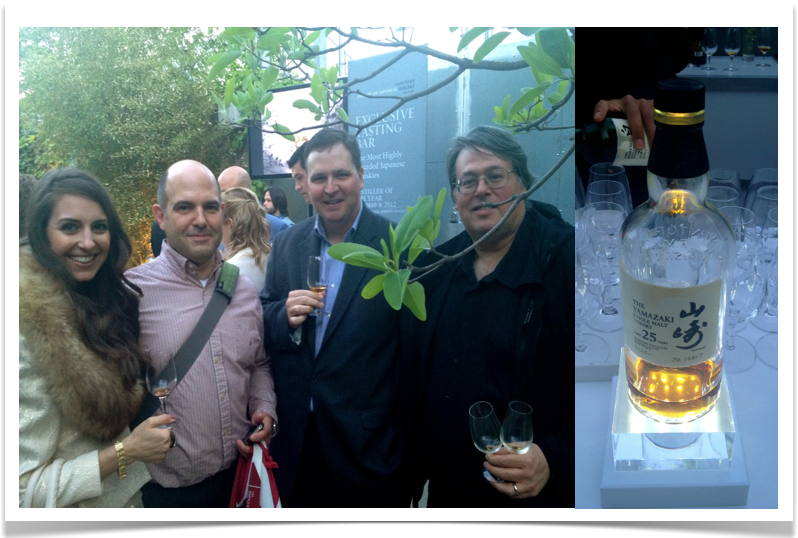 In the photo above on the right is William O’Donnell of The Men’s Collective and my husband, Nital Patel (which was a huge treat for me as it’s often hard to align schedules and actually attend a whisky event together!). After the guided whisky tasting – they opened up the other “stations” around as more guests joined in the fun. The food, which started flowing out of the hidden kitchen, was a collection of delicate little morsels of goodness made with the intention of bringing out a particular aspect of the Single Malts or Blends. We strolled, tasted, sampled, chatted and enjoyed ourselves for hours. Having particular joy in chatting with G-LO & Limpd of the It’s Just The Booze Dancing Blog, Josh Feldman, of the Coopered Tot blog (photographed below) and Stephen from The Malt Imposter. 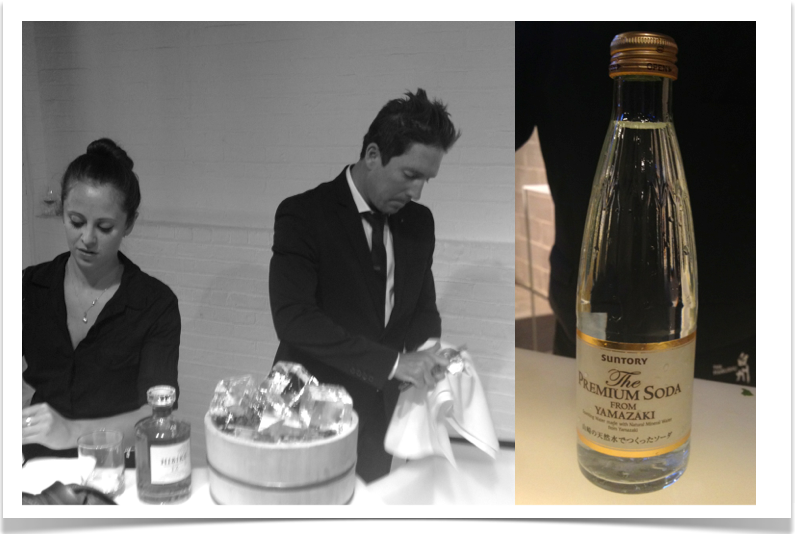 Below, East Coast Suntory Brand Ambassador Gardner Dunn quickly shaves large cubes of ice down into perfectly rounded spheres and Suntory’s not-for-sale sparkling water bottled at the Yamazaki distillery used in the Hibiki 12 Highballs. We ended the night strolling through the garden one more time – enjoying the sunset, whisky, food and company. But just when you thought they couldn’t pull out any more surprises, as we wound our way back through the museum to board a return bus home, there were YAMAZAKI TRUFFLES!!!!! I got so excited mine jumped from my hand and proceeded to roll across the floor at such a pace (leaving a little trail of dusted chocolate as it went!) I thought someone might have been controlling it via remote! Well, I can only be classy for so long, I’m surprised my bus didn’t turn back into a pumpkin halfway along the journey! 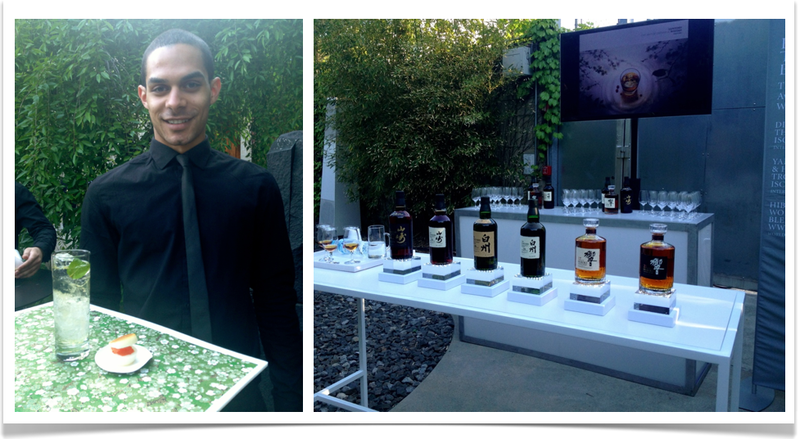 HUGE THANKS TO: Suntory & Exposure USA PR Company for hosting & inviting us to such a wonderful event. Particular thanks to Exposure’s Danielle Katz & Nicholas Rotondi for your generosity & going above and beyond to make us feel welcome. And BIG THANKS to the #WhiskyFabric crew who also attended and made this event feel far more personal than any event could. You can see the It’s Just The Booze Dancing review of the event HERE. You can see The Malt Impostor’s review of the event HERE. APOLOGIES to Suntory & Exposure for my month-long delay in writing this post! I wanted this to be as perfect as the event has been preserved in my head … but then realized that would be impossible and it was more important to just get this done! 😀 Sorry for the writer’s block! 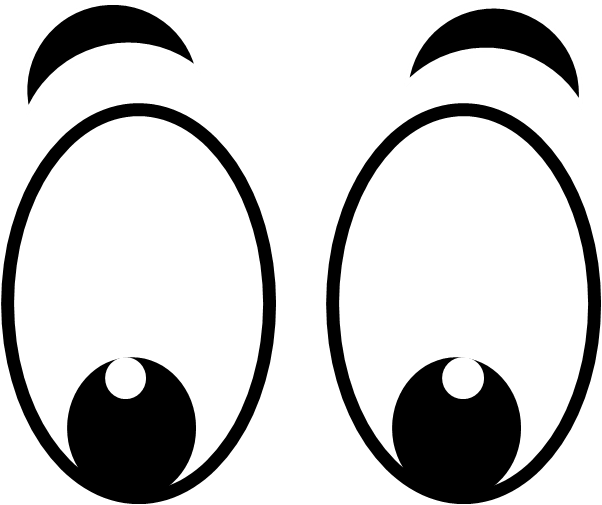 You are currently viewing the archives for June, 2013 at The Whisky Woman.